This is the first in a series of reviews of guns I own, have owned, or have shot enough to be sure of what I’m writing. Like everything here, this is based on my experience and research. Your mileage may vary. 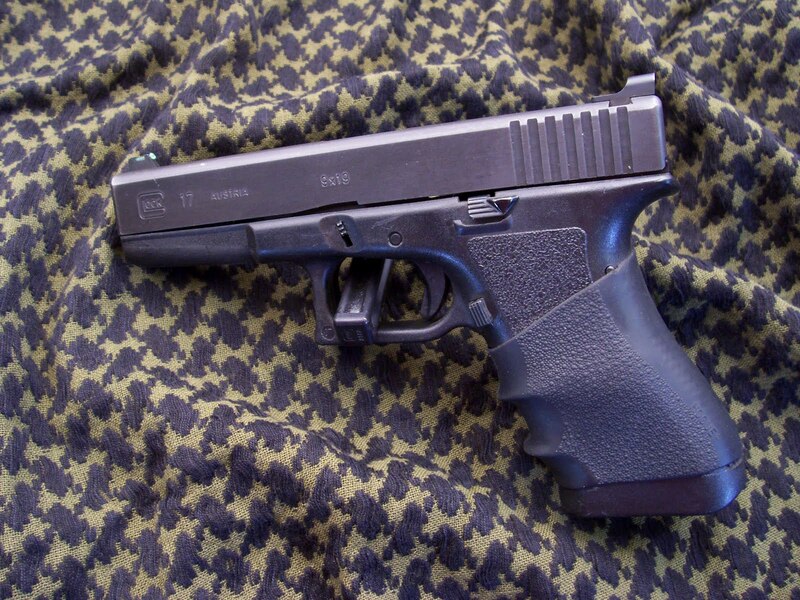 The Glock 17 is the full size 9mm version of the famous Glock handgun, first introduced to the US market in 1986. I bought Bruce, my Gen 2 Glock 17, in late 1992, from a pawn shop in a small town in Alabama. According to a serial number search I did through Glockmeister, it was made in March 1990. I don’t know anything more about it except the shop owner told me it was used. I’ve written about it in the past, so I won’t go into a lot except to say that, because of the ease of maintenance and exceptional customer service, the only original parts left are the polymer frame, the slide, and the barrel. Over the years, through the graces of the Glock Sport Shooting Foundation, everything else has been replaced. The performance of this pistol has been almost flawless. I estimate I’ve shot about 10,000 rounds through over the years, and in that time I have had exactly six failures, all of which were failures to extract. Three were due to a chipped extractor, which I was unaware of, thanks to a reluctance on my part to own up to the toll the ravages of time have taken on my close-in vision. Two were due to limp wristing (1 by me and 1 by my son), a failure of the shooter to support the gun to allow the cycling slide to completely extract the spent shell. The remaining failure was caused by me shooting the pistol without a magazine in place, to see what it did. Now I know. I have never had any light strikes on primers, no double feeds. In fact, for years, since I had no malfunctions of any kind, the only instruction I got on clearing malfunctions was watching fellow IDPA and USPSA competitors. The only magazine problems I’ve had were from the older, non-fully metal lined magazines, which were since redesigned. I’ve replaced all those magazines. As a Generation 2 frame, the gun has two pins (versus the 3 pins of later guns) and no finger grooves. Since about a year after I bought it, I’ve had a Hogue slip on grip installed. I did this more to provide repeatable indexing of my shooting hand, than as a grip aid. In fact, I find that the finger grooves on my Gen 3 Glock 19 are too close together, thanks to my unique hands – short, fat fingers, with a wide hand. (I also wear 4E shoes.) I also found that the Glock 26 I once owned was too small for my wide hands, even with an extended base plate installed on the magazines. In truth, there are four parts that I have replaced voluntarily, and not because they failed. I have installed Warren/Sevigny sights, an extended magazine release, an extended slide stop, and the (-) trigger connector, which some people call the 3.5 pound trigger connector. About three years ago I installed Warren/Sevigny Competition Sights with the fiber optic front sights. For about 2 years I had the red fiber in the front sight, and then I changed it to the green, admittedly on a whim. I find now that I prefer the green. I also like these sights a lot better than the Glock factory sights, especially the fiber optic front sight. They make the front sight really stand out, and they’ve made a big difference in my sight picture. About that time, I also installed an extended magazine catch. This was during the time when I released the slide from slide lock with my strong hand thumb, as opposed to using the method I use now, of grasping the top of the slide with my support hand and releasing it that way. As such, since I don’t (and never will) have a grip plug installed, this now qualifies as The Most Useless Modification I’ve Ever Made. 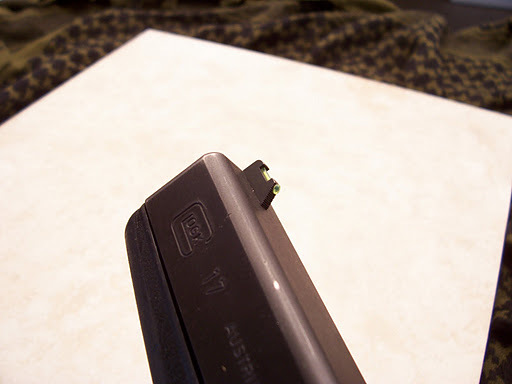 The purpose of the (-) connector is to reduce the trigger pull of the pistol from the approximately 5.5 pounds, to something less. I’ve never measured the trigger pull of my pistol, but I can say it definitely lowers the pull weight. Some Glock Factory Armorers call it the 2kg connector, and 2kg is about 4.5 pounds, so I will go with that if I have to. I only install the (-) connector on the pistol for competition or for practice, and never when I plan to carry the gun or have it available for home defense. A few years after I bought the gun, I bought a video Armorer’s Course, on VHS no less. (That should give you an idea of how long ago this was.) It contained a good bit on detail stripping and cleaning and lubricating of the Glock, but the host said that about the only modification he made was to polish the barrel feed ramp. I gave that a try, and was content with it. Until I discovered the famed $0.25 Trigger Job, so named because the cotton swabs and polishing compound required to accomplish it cost about a quarter. Basically, what this involves is polishing all the metal parts of the Glock trigger system that contact each other, so that they are smooth, and slide easily past each other. The original method calls for cotton swabs; I used a polishing wheel on my Dremel tool. Much faster. I’ve done this on all my Glocks now, and I would not own a Glock that I didn’t do this to. In fact, when I bought my Glock 21 a few years ago, I let my son dry fire it before I did the trigger work, and compare that to my Glock 17, and even he could tell the difference. The accuracy of my Glock 17 has never been an issue. I figure it is more accurate than I am capable of shooting. No, it will very likely not shoot one ragged hole at 50 yards. But it will put all its shots in the A zone of a USPSA target at 25 yards, and it will put all its shots in the center of mass of an armed attacker, as long as I hold the sights there while I smoothly press the trigger. And that’s all I require it to do. In the areas of reliability, durability, affordability, shootability, and customer support, the Gen 2 Glock 17 exceeds my expectations. I would recommend this gun, as well as the later Gen 3 and Gen 4 models, to shooters of all experience levels, for competition, recreation, or self-defense shooting.